HYLAS 1 (highly re-configurable satellite) was launched at 18.39 GMT on 26 November 2010 by Ariane 5 from Korou. Hylas 1 provides Ka band spot beams covering UK, Ireland, Spain and Germany, Eastern Europe, Italy, Greece, Hungary, Bulgaria, Moldova. It will provide high speed satellite broadband access plus ISP and Phone backbone capacity to a growing range of telecoms, enterprise, government and military customers. Hubbed out of Goonhilly satellite earth station, UK, with Hughes HNS 9200 VSAT technology. Avanti have announced that HYLAS 2, is due for launch at 9.50pm UK time on 2 August 2012 upon an Ariane 5 launch vehicle. 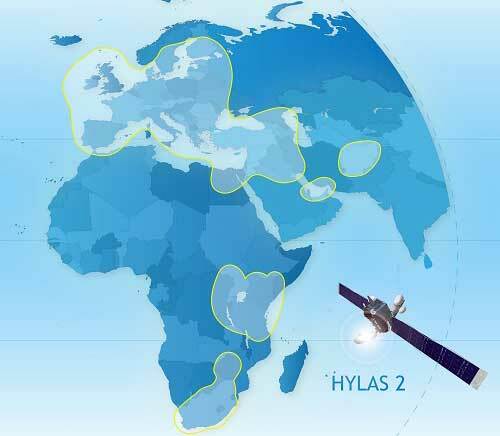 HYLAS 2, has almost three times the bandwidth capacity of HYLAS 1, and will increase the Company�s international coverage. It will provide high speed satellite broadband access plus ISP and Phone backbone capacity to a growing range of telecoms, enterprise, government and military customers in East and South Africa, the Middle East and across the Caucasus. HYLAS 4 launched 5 April 2018. It has 64 fixed spot Ku band (28 GHz) beams covering Africa and parts of Europe, plus four independent steerable beams ready to serve Africa, South America or Europe. Operated from five Gateway Earth Stations. The Yahclick service uses Hughes technology. 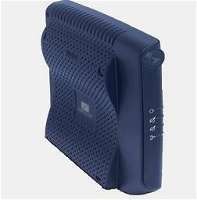 Home users will have the HN9260 modem and business users will have the HN9460 modem with two LAN ports and up to 20 PCs connected simultaneously. Customer dishes will be 74 or 98 cm diameter. A fair access policy will have a monthly allowance, with restrictions also based on traffic downloads over 72 hours and shorter periods. A free-for-all period will apply from 1am-6am during which large downloads are recommended to be configured, such as automatic software upgrades, download of films etc. Turkey, Cyprus, Armenia, Georgia, Azerbaijan, Afghanistan, Pakistan. Syria, Palestine, Israel, Jordan, Lebanon, Iraq, Iran, Kuwait, Bahrain, Oman, Qatar, UAE, Saudi Arabia, Yemen. 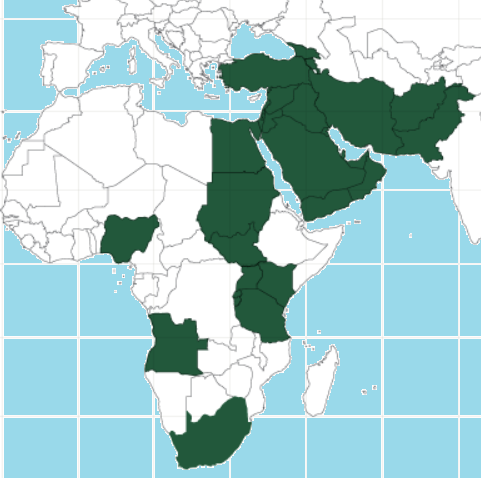 Nigeria, Angola, South Africa., Kenya, Tanzania, Uganda, Sudan, Egypt. 83 spot beam satellite at 9 deg east orbit position providing satellite broadband internet access for customers in 20 European countries including UK, Germany, France, Spain, Italy, Switzerland and Ireland. The main retail resellers and service providers are Bentley Walker and El Molino. Eutelsat subsidiary Skylogic in Italy operates a 12 hub Viasat Surfbeam network with the service being sold though many sales outlets as "Tooway" service. 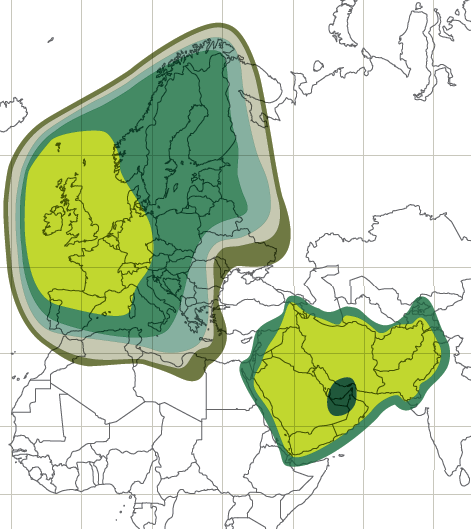 Tooway is primarily intended to provide satellite internet access for domestic and small business customers in remote locations within the beam coverages shown. Business service, TV uplinking, and military services are possible also. 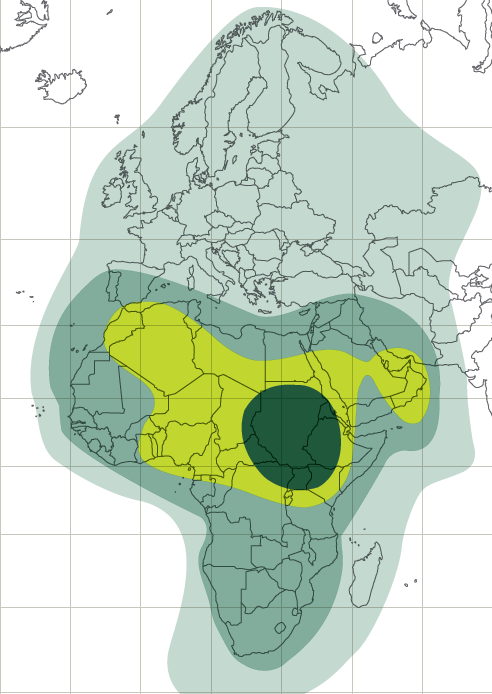 KA-SAT uses 28-29.5 GHz for the uplinks from the hub gateway earth stations. The hub transmits into 10 transponders, each 250 MHz wide intended for 10 customer downlink beams. Several carriers (possibly 7) are transmitted in each 250 MHz transponder, the carrier bit rate, clear sky, is believed to be about 68 Msps, matching the capability of the customer present Surfbeam modems. KA-SAT uses 29.5-30 GHz for the uplinks from the customer VSAT terminals. Each customer terminal may transmit on either polarisation and in the upper of lower halves of the 500MHz. The require option from the 4 permutations, depends on site location and the colour of the customer beam. KA-SAT uses 17.7-19.7 GHz for the downlinks to the hub gateway earth stations. There are 10 transponders (5 on each polarisation), one transponder from each of 10 customer beams. KA-SAT uses 19.7-20.2 GHz for the downlinks to the customer VSAT terminals. This 500 MHz is used to provide one 250 MHz transponder in each spot beam. The 4 non-adjacent types of spot have colours, representing 2 polarisations and the lower and upper halved of the 500 MHz available. Total claimed capacity = 70 Gbit/s. 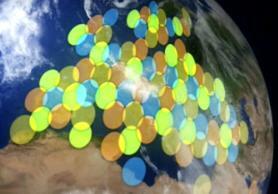 This is a satellite constellation system involving medium height satellites orbiting above the equator. The satellites move across the sky. Each earth station sites need two motpr driven tracking antennas to provide a continuous connection. Due to the cost of the susteomer terminals, the service is intended for very high bit rate town or community sites, where the local end users will be connected via terrestrial means, wireless and cable. The satellites each have 12 spot beams. 2 of these beams are aimed at telport hub sites and the remaining 10 point at customer antenna sites. As the satellites move from one region of the world to the next, so must the satellite antenna beams be stepped forwards to the next service are and then slowly tracked so as to remain pointing at that intended are until the time for the next big step forwards occurs. Legacy network that was forerunner of the Ka-SAT system. One broad downlink coverage beam and four uplink beams. Viasat Surfebam hub: Advanced coding/modulation and dynamic rain fade mitigation techniques are used to minimise outages during heavy rain. The return links and capacity are dynamically assigned to make best use of the satellite capacity available. Eutelsat send out Press releases from time to time and I am sent information by Bentley Walker and El Molino to help me put informative information here.